wan life to live: i AM betty crocker. after months and months of eating dry cereal, the bean has finally discovered the joys of eating it out of a bowl, drenched in milk. 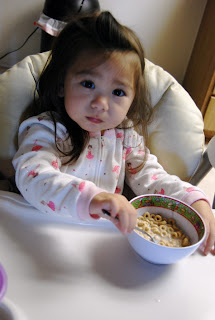 "dump it, mommy, cereal and milk!" hilarious. while doing my weekly grocery shopping the other day, i found portobello mushrooms and asparagus on sale. i didn't have any ideas as to what to do with them, but i figured i'd scoop some up and figure it out later. 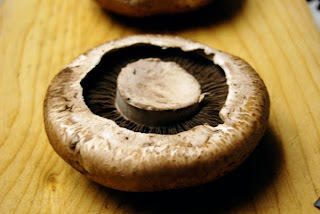 and as always, google came to my rescue and gave me a link to asparagus-stuffed portobello mushrooms. duh - how easy is that? i should've thought of it myself. 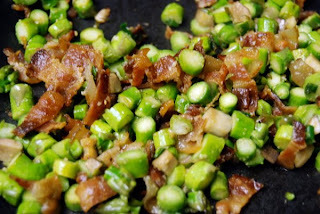 and then i was hit with a stroke of genius as i opened the fridge to grab the garlic and found a baggie of bacon i'd cooked up the other day for something else. i decided to improvise a little and tossed it in. you'd expect nothing less, right? 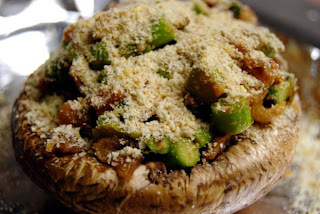 once the veggies were cooked to a perfect crisp-tender stage, i scooped the mixture into those 'shrooms and topped them with some breadcrumbs and parmesan cheese. 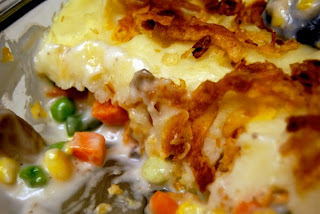 for our main entree, i whipped up a quick and easy batch of vegetarian shepherd's pie. 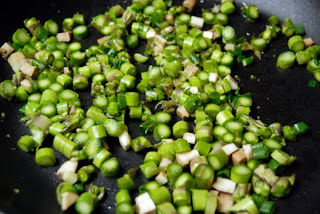 i'd found the recipe on the betty crocker website, which is turning out to be my go-to for recipes these days. yesterday, my buddy claire tweeted a recipe she'd just tried for chicken piccata. she swore it was super easy and really good, and having no other ideas for that night's dinner (so much for meal planning, huh? ), i printed it out. luckily, i already had all of the ingredients just lurking in my kitchen, so all i had to do was defrost some chicken and i was good to go. 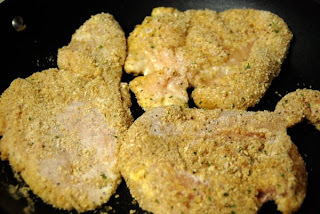 following the directions, i pounded the chicken to about 1/4" thick, seasoned both sides, and then dredged each piece in seasoned flour, then egg, and finally coated it in breadcrumbs. after a quick session in my skillet pan, it came out lovely and golden brown. 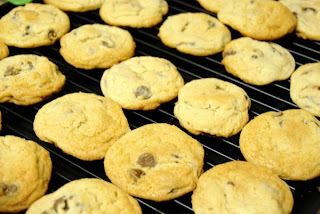 in between cooking the chicken, i'd whipped up another batch of chocolate chip cookies. yeah, we're trying to get in shape, but it's not the wan house without cookies in the kitchen. cutting them out completely would be just sad. after averting a near-disaster with the rice (which i'd forgotten to start and ended up doing an improvised quick-cook version. luckily, it turned out fine and not crunchy), i tossed the chicken in the oven to finish cooking while i cooked the lemony sauce. and then i realized i didn't have wine and used chicken broth instead. oy vey, so much for being prepared. i even forgot to make some sort of vegetable. well-rounded dinner FAIL. at least the chicken and rice was good. nay, it was scrumptious! many thanks to claire for passing on the recipe. it's a keeper. lastly, birthday greetings to my dear friend MommyBelle! she's the biggest birthday princess i know besides me and the teen, and i hope her hub has something fun planned for her today. happy birthday, you big ol' hobag (said with a lot of love, and she knows it)! YUM - thanks for the links to the great recipes, Betty. Hmm. That came out wrong. You know what I mean! Drooling. Again! Those 'shrooms look delish! 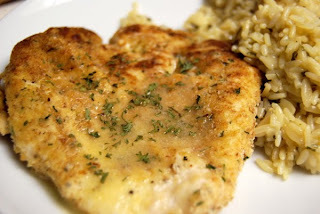 I love the Chicken Piccata recipe. I always make extra to use as a great lunch salad. Cut up the chicken and use the lemon sauce as your dressing over greens. It's my favorite salad. I love all things mushrooms. I do. Therefore I love this post. subbing chicken broth for wine? Totally Betty Crocker and completely fabulous. Some people refuse to use wine for cooking and they'd do the same thing. 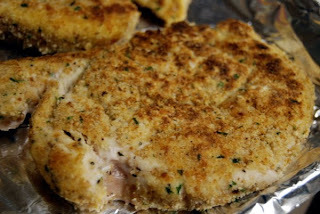 But breadcrumbs on chicken piccata seems like a waste since it gets so golden and crunchy with just the flour dredge. Yo Betty! All the food looks fab. Love me some stuffed portobello. I'm all about stuffed mushrooms! I recently was also forced to do a quick cook version of rice, but mine turned out meh :( Your food all look fabulous! I love stuffed mushrooms.